This ten year old is the only malt produced on the Isle of Skye. It has a smokey nose and the sweet maltiness is perfectly complimented by its spicy, long finish. Sweet and mellow, with a slight saltiness and a bit of oak on the finish. 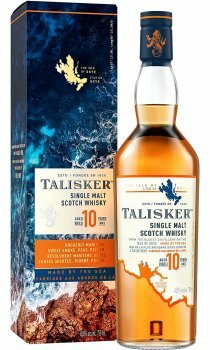 This is an interesting and easy drinking dram; highly recommended although I admit that I am biased because I love Skye and drinking this brings back memories of sitting next to a huge fire in a decent pub on a dark winter night having spent a day in the snow and the wind on a huge and foul mountain. A good intro to malts though. At first this is quite a challenging whisky, I'm not too experienced with the smoky whiskies. However, after a few drams I really enjoyed it. Myself and a friend polished this off over a weekend, it was far too good to leave sat there. I'd highly recommend this whisky.